Brrrrr. Since the temperatures in our area have blanketed us with more snow, we’ve been out clearing driveways and sidewalks but don’t forget to clear off, that grill of yours! 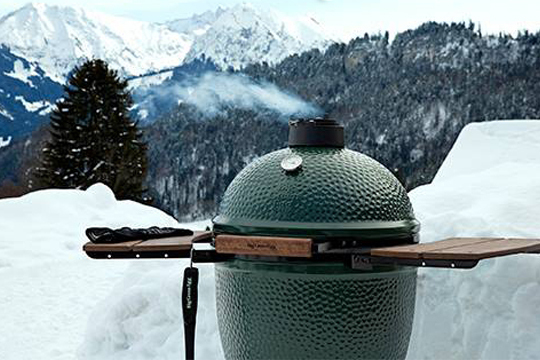 It’s wintertime but just because we have snow doesn’t mean that grilling has to come to an end. Enjoying your barbecue can be a year around experience. To enhance your winter time cooking adventures, here are a few tips! 1. Protect your grill and keep it covered. Purchasing a cover for your grill will protect it from the elements. Having a cover will help make it easier to access your grill after the snow flies because you will be able to remove the accumulation of snow with a brush or broom then remove the cover. Having a grill that is free of ice and snow makes it so much easier to cook your favorite meals! During the cold winter months it is easy to forget how much fuel you have left. Depending on what type of grill you have, you will want to make sure that you keep charcoal or pellets in a cool, dry area. For propane grills having an extra tank one on hand can never hurt. Being prepared and ready with cooking fuel will help you reduce the time you spend out in the chilly weather preparing your grill to cook. In colder temperatures it is so important to remember to take your time while cooking. This also means giving your grill time to get warm and preheat prior to cooking. Another important part of taking your time is allowing your grill cook. Keep the lid closed and keep the heat cooking your food.